Scott Pendlebury is the winner of the E.W. Copeland Trophy for 2013. 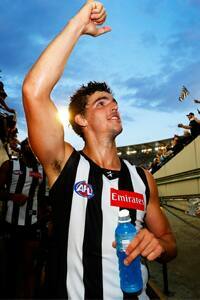 Collingwood midfielder Scott Pendlebury has capped off an outstanding 2013 season by claiming his second E.W. Copeland Trophy at Crown’s Palladium Ballroom this evening. The 26-year old, who also received the Darren Millane Memorial Trophy as Best Clubman, polled 192 votes to clinch the Magpies best and fairest award ahead of fellow on-baller and three-time winner Dane Swan, with utility Steele Sidebottom running third. Pendlebury’s triumph represented due reward for an outstanding campaign, one which saw the Collingwood vice-captain earn a fourth consecutive All-Australian jumper and win a number of major awards. A paragon of consistency, Pendlebury was one of only three Magpies to feature in all 23 matches this season, averaging 29.9 touches per game, a career high, while ranking second in the AFL for total disposals (688), sixth in clearances (131) and ninth among contested possessions winners (290). Pendlebury also proved productive on the scoring front, kicking 18 goals and recording 19 assists to emphasise his all round influence as he helped inspire Collingwood to its eighth successive finals series. During a season where he registered his 150th appearance at AFL level, Pendlebury produced a host of stellar displays, none more masterful than against Adelaide in round 16 when he accumulated 42 possessions and produced eight clearances, eight inside 50s and 16 contested disposals in a 27-point triumph. Recipient of the R.T. Rush Trophy as runner-up, Swan meanwhile maintained his extraordinary consistency on Copeland night with his sixth placing in a row, testament to a star that has shone brightly throughout the most successful era in Collingwood’s modern history. Leading the AFL in total disposals (717), Swan proved as damaging as ever in 2013, ranking fourth overall in inside 50s (119), booting 21 goals, winning his fifth All-Australian selection and finishing two votes shy of a second Brownlow Medal, while also being voted the Magpie Army Player of the Year. It was a season-long display to suggest that Swan will remain a force in years to come. The three-time Copeland winner finished the campaign with a flourish to the extent that his performance against Port Adelaide in September saw him recognised as the Bob Rose Award winner for Best Finals Player. Third placed Sidebottom was acknowledged for his continued rise with the J.J. Joyce Trophy in the wake of a season which showcased his remarkable versatility. Fielded across half forward, midfield and half back over the course of the year, Sidebottom’s adaptability was evident in his numbers; he ranked in the club’s top five for total disposals (555), contested possessions (178), marks (120) and goals (19). After navigating three injury-afflicted years to finally make his AFL debut, another chapter was scripted in midfielder Josh Thomas’ outstanding tale of perseverance as he claimed the Harry Collier Trophy as Best First Year player. Playing 19 games, Thomas’s qualities became more apparent as the season moved into and out of winter, a fact highlighted by a 35 disposal performance against West Coast in round 22. Thomas averaged 19.1 touches per match while ranking fourth at Collingwood in clearances (61), fifth in contested possessions (151) and sixth in inside 50s (62). Finally, All-Australian forward Travis Cloke won his third Gordon Coventry Trophy after booting 68 goals in 22 matches, Jarryd Blair claimed the Gavin Brown Award for leading desire indicators and rookie Kyle Martin was named the Joseph Wren Trophy winner as the VFL Best and Fairest Player.